f not berry season here in Paris, though frozen mixed berries comes to rescue if i plan something to dish out with mixed berries. Mixed berries works awesome either in bakes though i usually prepare them as mixed berries jam quite often. 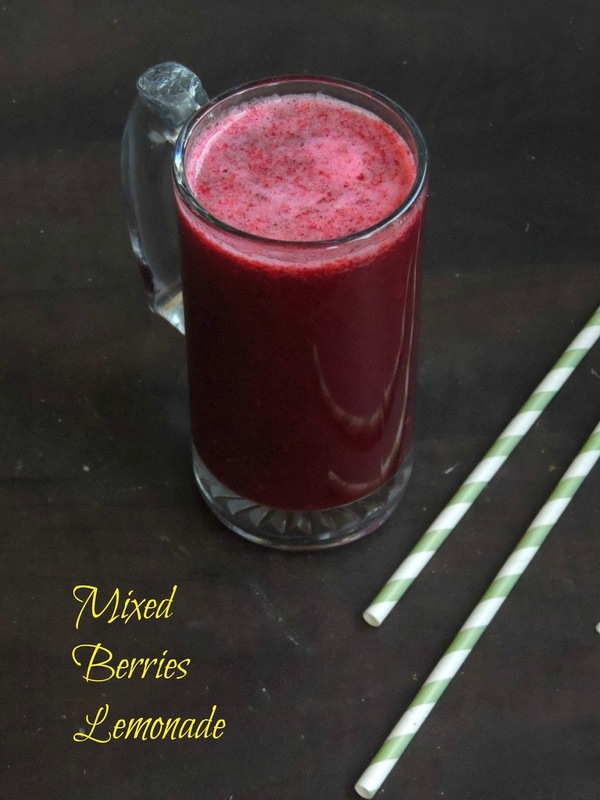 However if you get a chance to whisk out something different from the usual way of dishing out something with mixed berries and lemon, how can i resist to blend together to prepare this ultimate summer drink. This mixed berries lemonade is definitely a summer treat, a fabulous thirsty quencher, you can prepare this lemonade with simple efforts. You might have noticed that i have been posting Easter special recipes for this week's blogging marathon which are definitely Kid's friendly dishes coz of the theme. Yes my theme for this week's blogging marathon is Kid's delight - Easter foods. After two incredible baked goodies, i couldnt stop myself to bake an another interesting, damn cute and dangerously addictive Easter special bunny buns. 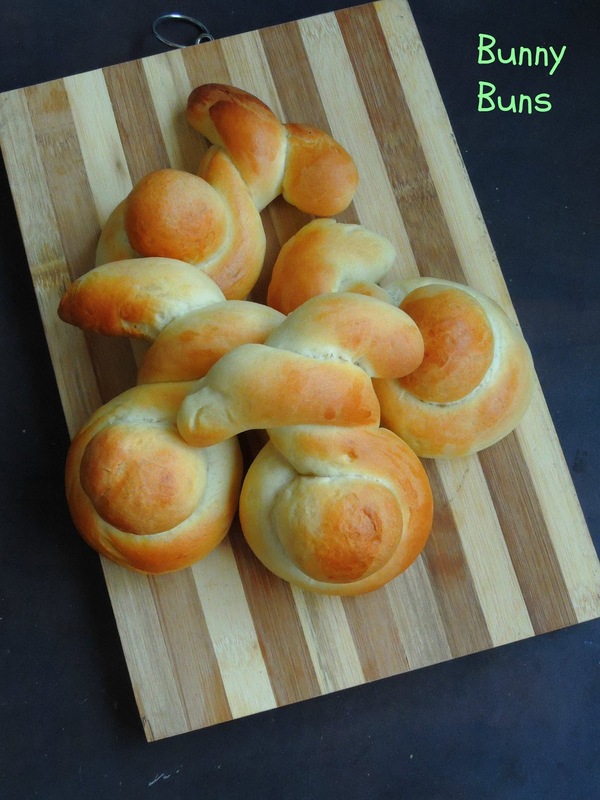 This buns calls for an eggless bread dough, which starts with a sponge, This bunny buns are prepared with sponge and dough method of kneading. Sponge is a yeast starter which is prepared easily with flour, yeast and water. Once the pre-fermented dough gets ready, you can prepare your dough with usual ingredients. This sponge method is used for three different reason, one is for their texture, taste and chemistry. After some delicious orange flavoured chocolate loaded hot cross buns, i couldnt stop myself to post this dangerously addictive sugar cookies. Once again its a chocolate based baked goodies, very simple to make these sugar cookies suits absolutely prefect to pack in a kid's snack box. During my recent visit to a super market i got a packet Easter special cookies moulds. Back home i tried this bunny shaped moulds for baking this dangerously addictive cookies. You just cant stop yourself munching this incredible chocolate sugar cookies. Yes they are simply awesome and easy to bake. 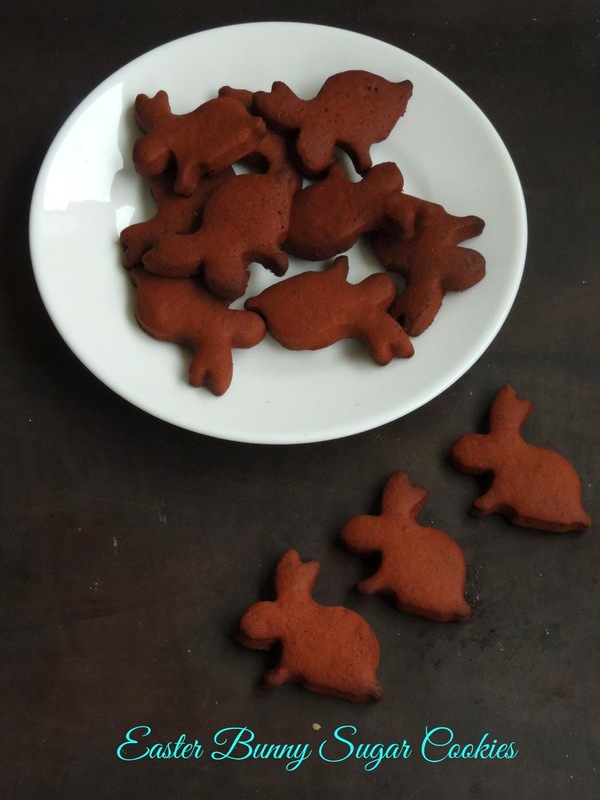 A chocolate sugar cookie dough is quite enough to make this cute looking bunnies. A hot cross bun is a spiced sweet bun made with currants or raisins, marked with a cross on the top, but many different versions do exists. My today's post is one among those variations. Its completely a kid's friendly baked goodies which i simply baked with orange zest, orange juice and chocolate chips. If you love citrus flavored baked goodies, am sure you will definitely fell in love with this incredible buns. 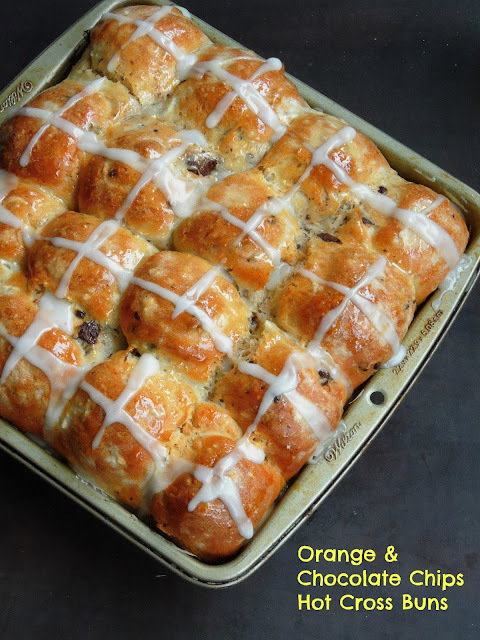 I piped the top of these hot cross buns with two strips using both flour paste and icing sugar glaze however you can definitely skip the flour paste or else the icing sugar glaze or vice versa. After baking, i simply brushed these buns with a honey glaze to give the sweetness and a super shine. If you are a chocoholic person, am sure this Swedish Chocolate cake will definitely become your most favourite. Trust me am very sure in it. Yes this chocolate cake is not only the best i have ever eaten but its one of the easiest cake one can bake out just like that. This cake is a one bowl cake, no need of modern gadget just a whisker is needed to whisk the batter. Within 20 minutes, this gooey,oozy chocolate heaven will get ready to please your tastebuds. 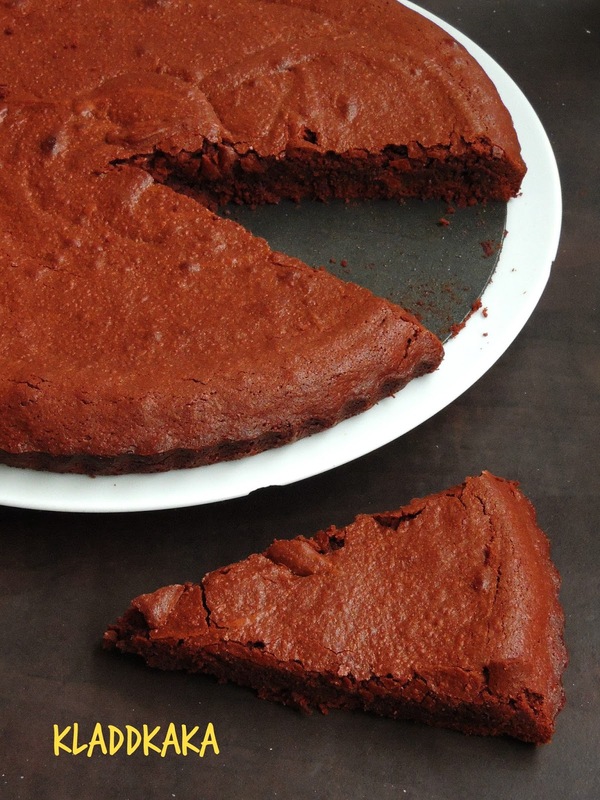 Do you know this Swedish chocolate cake aka Kladdkaka is a very famous cake in Sweden and everyone's favourite there.This cake came out with delicately crisp and chewy top with a super soft and fantastic gooey inside. To be honest, this sticky Swedish chocolate cake is a cross between brownies and chocolate souffle. Apple cake is quite common in most of the International cuisine, obviously when i picked Swedish recipes for this week's theme, i looked for Swedish version of Apple cake. And the description of this Swedish apple cake pulled me to give a try to this pie like Swedish cake. Actually a pie crust like dough is used for making this fantastic apple cake. With a crispy outer and a succulent apple slices loaded inner, this Swedish apple cake will definitely please your tastebuds. 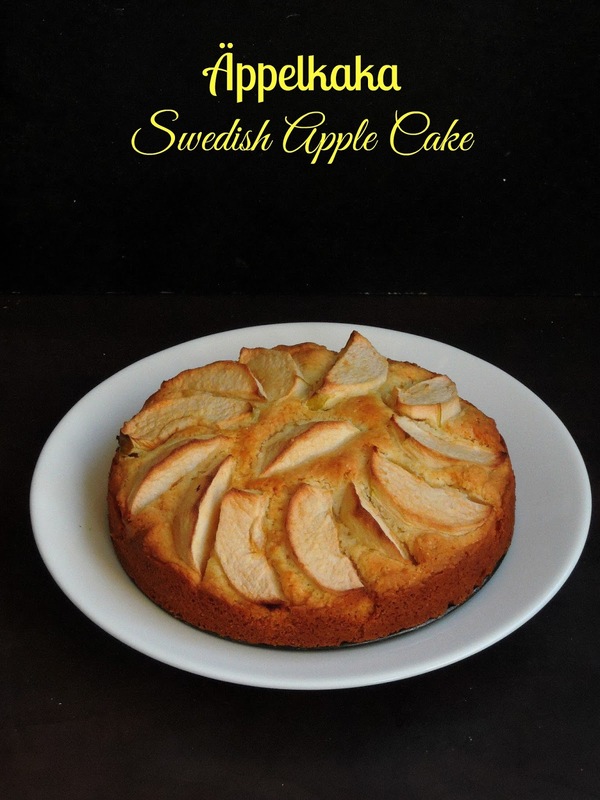 This apple cake is quite a common dessert in Sweden, which is served around the year either for snacks or else for lunch or dinner after a meal. Usually served with a traditional accompaniment aka Vanilla sauce, this cake makes a fabulous and delicious dessert to enjoy without any guilt. To be honest, i have been exploring Swedish cuisine recently and all the credits goes to this week's blogging marathon's theme. Yes am running this week's blogging marathon with Swedish Recipes as theme. 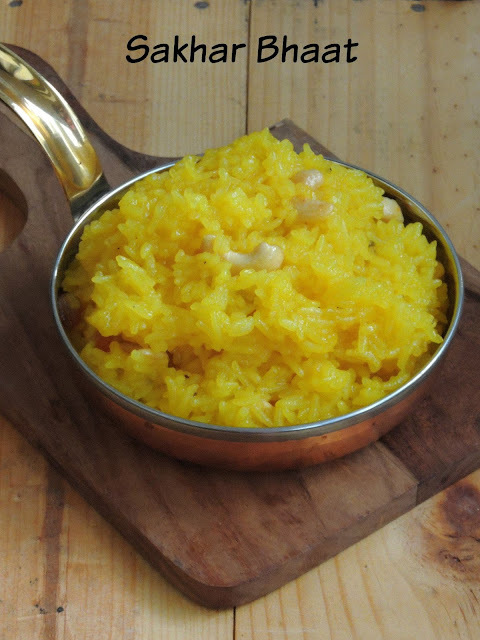 Though this cuisine is not that much familiar to me, i have baked and cooked few dishes only after i have started blogging, obviously this week's theme pulled me to go and look for many interesting and fantabulous baked dishes from this cuisine. 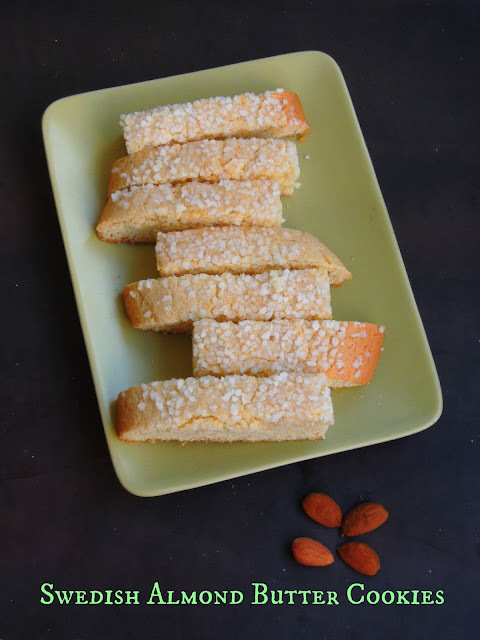 Am kick starting this week's theme with an extremely delicious, dangerously addictive Swedish butter cookies flavoured with almond extract. Almost shaped and baked like Italian biscotties, these baked goodies are called as butter cookies. Yea even i was bit intrigued about the texture of this cookies before baking, but i was completely wrong, i have fallen in love with this cookies. This cookies can be baked longer for crisp cookies and shorter for chewy cookies. I baked mine as crispy cookies. Its almost going to be spring season here, obviously citrus fruits like oranges, celementines or manadrins have to leave their place in fruit stalls for spring seasonal fruits and vegetables. What you will do if you have sour clementines at home, actually the last batch of clementines i bought before the season ends turned out super sour.Obviously we dont even want to touch them. Since i dont want to trash them , i cant think anything rather than making some marmalade with those clementines. Needless to say anything sour when cooked with sugar will definitely become sweet na, hence this spiced marmalade. Actually i used cinnamon stick to spice this ultimate marmalade, and trust me this marmalade is a super easy recipe. 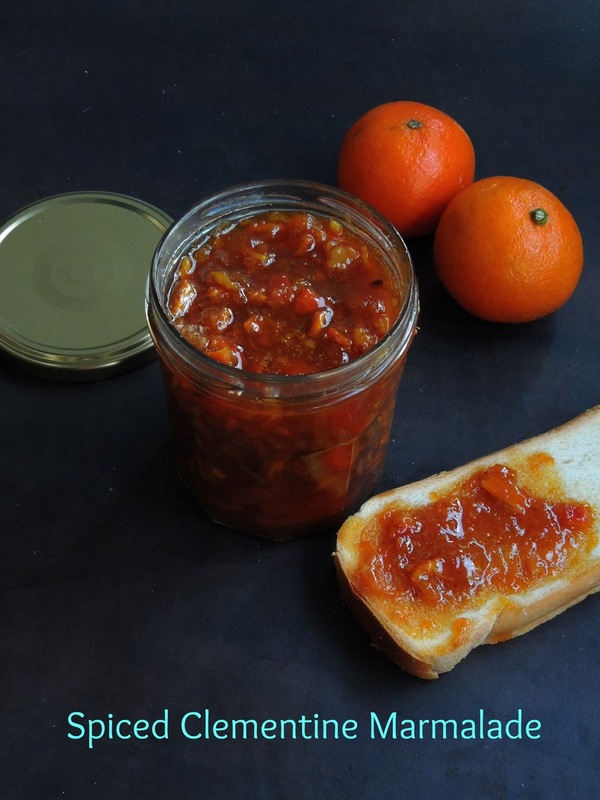 Yes a simple cooking process, if you love citrus marmalade, am sure you will definitely love this fantastic marmalade. Pickle is a part of our meal, my hubby cant finish his lunch without a pickle, obviously i have to dish out couple of pickles at home with varieties of vegetables and seafoods. Yes i do prepare pickles with both prawns and fish or else with meats. However i do make instant version of pickles often at home as they are easy to dish out with less efforts and these instant versions of pickles are ready to relish with your favourite dish after a day. 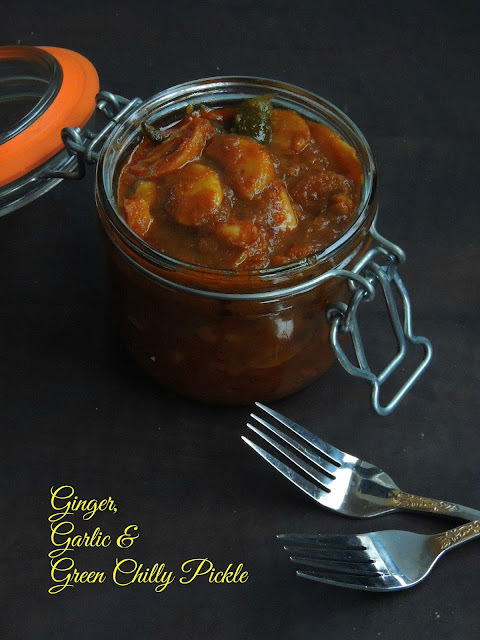 My today's recipe is a very simple but a delicious and super spicy pickle which is simply dished out with loads of garlic cloves, green chillies and finely chopped ginger. These three ingredients goes awesome very well together to make this lipsmacking pickle with less efforts. Teriyaki is a technique in Japanese cooking in which fish, chicken, or beef are first marinated in a soya sauce reduced with sugar or honey and then grilled over a open flame. However recent way of cooking with this technique involves lot of sauteeing, broiling in open flame or else as grilling. Coming to Teriyaki sauce, this sauce goes of sweetness and tanginess coz of the soya sauce, rice wine or else mirin a sweet rice wine and sweetner like sugar or honey. Usually store bought, this sauce can be prepared easily at home with simple ingredients. 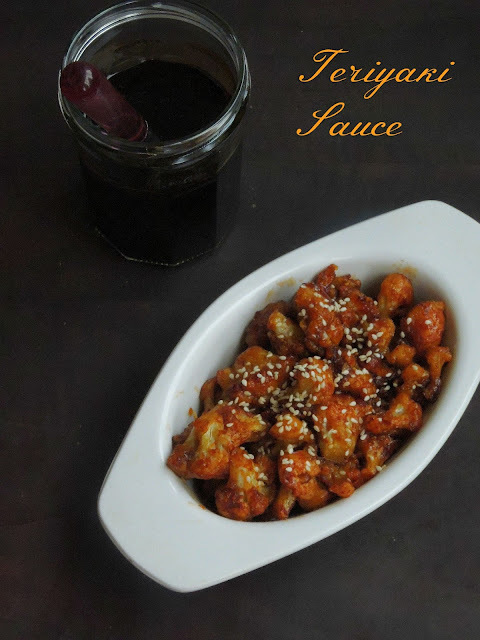 My today's version of teriyaki sauce calls just for simple ingredients, yes this easy breezy version of Teriyaki sauce goes for Soya sauce, honey,corn flour, finely chopped ginger and garlic. Wiki says that Thandai, or sardai, is an Indian cold drink prepared with a mixture of almonds, fennel seeds, watermelon seeds, rose petals, pepper, vetiver seeds, cardamom, saffron, milk and sugar. It is native to India and is often associated with the Maha Shivaratri and Holi festival. 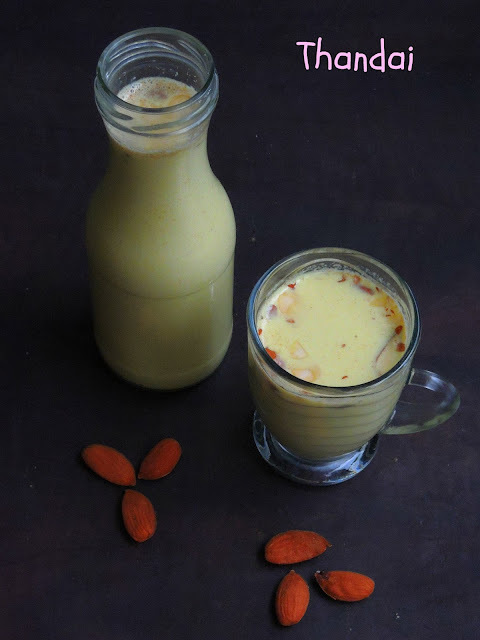 The consumer of this Thandai is mostly from Rajasthan and Northern India. Thandai is the most known drink prepared especially during Holi festival. Holi is a festival of colours and this Hindu festival is celebrated to mark the beginning of Spring which will be celebrated on Monday 13 2017. It is celebrated each year around the time of the Vernal Eqinox, its typically celebrated in March but sometimes as early as February. Gudi Padwa marks the beginning of New Year in Maharashtra. This festival is also known as Gudhi Padva. Gudhi padva is considered as one of the foremost auspicious day in the year when people start new ventures.On the festival day, people decorate their houses with mango leaves and 'rangoli' designs, and pray for a prosperous new year. They visit the temples to see the yearly calendar 'Panchangasravanam' as priests make predictions for the upcoming year.It is a tradition to serve bitter leaves of neem tree with jaggery as Prasad on Ugadi/Gudhi Padva. Gudi Padwa is considered as an auspicious occasion to make investments like buying a house, jewellery and other new things. The festival is celebrated when the summers begin and the time for harvesting the crop arrives. The fragrance of ripening mangoes, jackfruit and other seasonal fruits fill the air with sweet smell. Pesarapappu means Yellow moong dal in Telugu, and my today's post is this delicious moongdal sweet polis, you may wonder why am talking about this ultimate sweet. Let me tell you, i will be posting three different festival recipes during this week of blogging marathon as i picked Festival Recipes as theme. For the first day of this week's blogging marathon, am posting this Pesarapappu bobbatlu as this sweet flatbreds have their own place in Sankranti or in Ugadi feast. 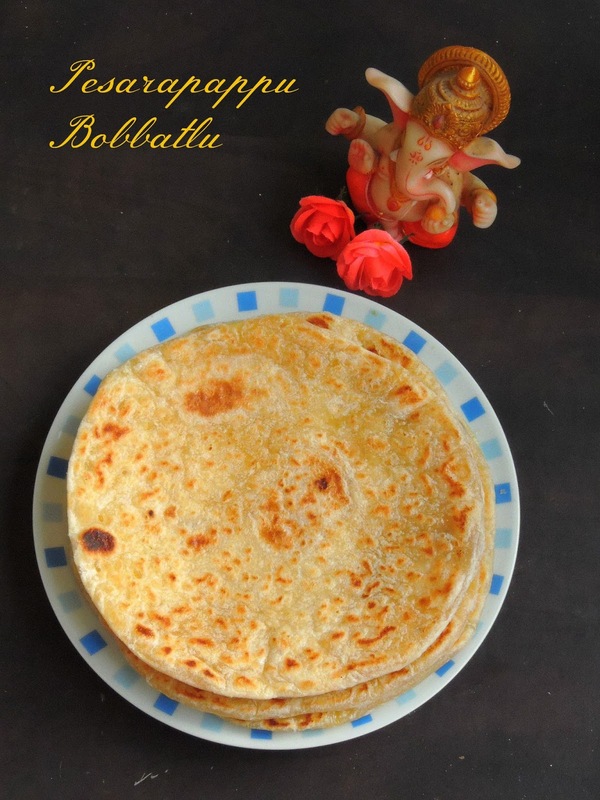 Usually the classic traditional festival sweet Bobbatlu aka obbattu, holige, paruppu poli is prepared with channa dal-jaggery stuffing, but this yellow moongdal flatbread is prepared completely with sugar and cooked yellow moongdal. Obviously its quite a different poli/flatbread to give a try if you want something new to dish out for your pooja.